&sql(INSERT INTO WINSURGE_RESULT_FACT VALUES :FIELD())  sections of code. I'm not sure what needs to be changed. In order to use a table in an external DB you need to LINK this table to your Caché instance. Then you use this proxy class as you would do with a local one. Table 'WINSURGE_RESULT_FACT' should then be visible and accessible. I used the link table wizard as you suggested and came up with winsurge_dmp.winsurge_result_fact. When I try to compile my code, I'm getting an sqlcode=-30 error indicating that table doesn't exist. I think my error is somewhere in this section of the code, but after trying several different things, I can't seem to be able to figure it out. do you really write to ALL fields of the external table ??? Robert, thank you for all your help. I try running the program and it gives the same error. Sorry you went to CLASSES not to SQL !!! These are different worlds with different rules and syntax. It is just by accident if TABLEs and CLASSes have the same name !!!!! I'm still unable to determine why I can't insert into the external database. I came across something in the documentation about creating a new DSN for an external database connection. Do you think that might be my problem? Sorry, please disregard this update. I found that I have already created the dsn but didn't remember doing that. 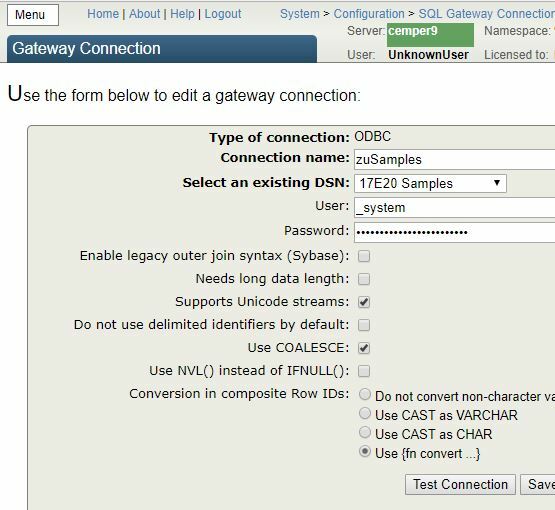 the DSN is used when you set up your SQLgateway connection. There all information on the DSN is stored. Next if you Link the external table this gateway entry is used and stored for access. So you are fixed for THIS namespace. This is static. it could happen that you have to do this again. Similar for a different target table you have to do the Link again. A different issue could be that you might just have read access to the foreign table. Then I'd expect some kind of error message. At least it is something the partner side has to manage. Hi Mike, Robert was right that you checked the class name while the table schema/name will probably be different. 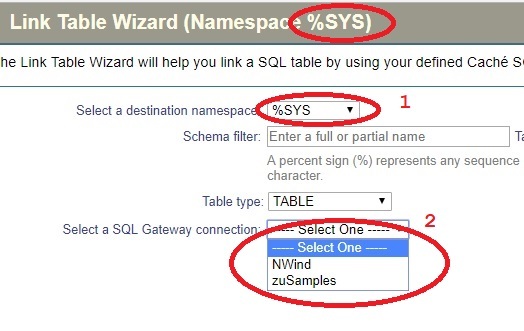 Let's find out the table name at the SQL page : Management Portal > System Explorer > SQL, click the Tables link in the left menu and check if there is any table with similar schema / name to the one you expect. In my Management Portal > System Explorer > SQL page, I do not see a tables Link. Where would that be. SET myquery = "SELECT TOP 1 CLIA FROM WINSURGE_DMP.WINSURGE_RESULT_FACT"
Is there something I have missed which controls the insert of data into an external database? I just realized that running the query from the terminal does not work. Yesterday I had run the data import wizard and copied the database from Oracle into Cache. The code worked on the cache data. I killed the globals that were created from the import and tried to code again, and it returned no data. It did no give any errors, it simply found no data. If I import the data and update it in cache with new data, will that update the external database as well? I doubt that would be the case. sorry for not fully understanding that link table was for data transfer in both directions. the wording (and help text) sometimes not really guiding. but you motivated me to use more screenshot for explanations. I finally got the code to compile with no errors. When I run it, the code will insert a row in the table "global" in cache. However, it isn't inserting the information in the external database. I have also been looking at manually updating the external sql database by using the management portals data export function to create a file for importing into the external database. However, the data export only creates a .txt. The external database import function only accepts either csv or xml files. Is there a way to make the export function create a .csv or xml file? If not, I can write something to create .csv file . I finally got the code to compile with no errors. When I run it, the code will insert a row in the table "global" in cache . However, it isn't inserting the information in the external database. as there is a GLOBAL and you write to your local DB. As you have seen. 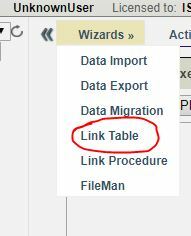 If you use Link Table Wizzard to create it, then there is just no global. /// Generated by the Link Table wizard on 2018-05-07 23:20:46. Note that you can access the data in this class only when the external database is accessible. you are in the wrong Class / Table with no access to he external table. - you have no storage for streams defined. Strange but might be an issue of Caché version version issue. in 2016.2 it just doesn't compile without. The property null doesn't exist in your class. Without a property null it doesn't compile for me. let it compile for me. Though this may be a temporary fix I distrust your Link Wizard. Eventually, you should contact WRC to investigate the reason. I added it just to the end. But thas nit important. Did you also add at the end this: ?? If this is missing the class also doesn't compile. the name of the global for streams is not important. BT: What error did you get ?